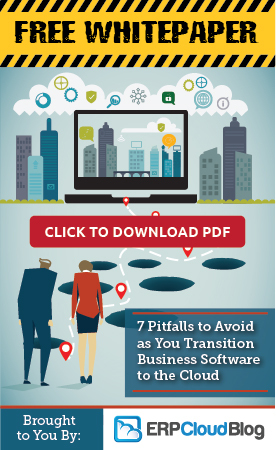 Research Report Warns Buyers to Beware of Faux Cloud ERP! How can you determine if an ERP product is a “real” cloud ERP system versus a legacy system that has been adapted for the cloud? A new research report “Clearing the ERP Clouds” by SMB group helps gives helpful tips to warn you of what they call “Faux Cloud ERP”. Get more details on each of these eight points in the report, Clearing the ERP Clouds, which offers an extensive look at the benefits of cloud ERP and advice on how to choose a good product and vendor. Download here. Acumatica ERP is a true ERP Cloud system. Nothing fake about it. It was originally developed in the cloud, not adapted. And it is the fastest growing cloud ERP on the market. When you are ready to discuss how Acumatica can benefit your specific business, contact CAL Business Solutions. 860-495-0910 x4 or [email protected]. By CAL Business Solutions, Connecticut based Acumatica and Microsoft Dynamics GP Partner, www.calszone.com. Does it Matter What Business Technology You Use? Oh Yes!